Please read the following statements carefully so that you will understand the procedures for this session. If you would like to speak with one of our certified counselors, our agency can be reached at 316-265-2000. If you are completing this process by phone your counselor will ask you questions about your budget, assets, creditors, and factors that led you to consider bankruptcy. After reviewing all your information, your counselor will conduct an analysis of your financial situation and explore your options with you and develop an individualized action plan for dealing with them. When you complete this process by phone your counselor will email, fax or send you copies of this information. Click here to submit your budget online for phone counseling. Click here to download printable budget forms. In addition, the quality of the counseling session will not be diminished if you are completing the counseling session by telephone. At the conclusion of the counseling, you will be provided with a certificate that you will need, should you decide to file for bankruptcy. The certificate of completion will be issued no later than one business day after you complete the counseling session. You will only receive the certificate if you complete the entire session. This certificate is valid for 180 days from the date and time the counseling is completed. 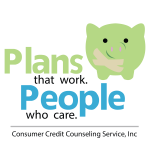 A CCCS certified consumer credit counselor will be conducting this session. While he/she has expertise in helping those with financial problems, he/she cannot provide you with legal advice. In fact, this session is designed to provide you with information and alternatives; it is not intended to take the place of a consultation with an attorney to explore your legal rights and options. To help cover the cost of providing this session to you, this agency charges a fee. The cost is $50 for phone counseling, regardless if you file single or jointly, payable by debit/paypal. The fee may be waived based on your lack of ability to pay. A waived fee is based on 150% of poverty guidelines updated periodically by the US Department of Health and Human Services. If you think you qualify for a waiver please call 316-265-2000 or Contact Us. The fee amounts include any fees associated with generation of the certificate. In order to assist you, it is essential that you provide us with information that is as accurate and complete as possible. For that reason, we may ask you to authorize us to access your credit history. Your credit report is not impacted by obtaining counseling through our agency and our agency will not disclose or provide any information about this counseling session to any credit reporting agency. Rest assured that the information concerning your financial condition and status that you provide during this session is strictly confidential. Such information would include, but is not limited to, income, debts, credit accounts, earnings, assets, employment data, etc. We will not disclose any such information that you provide orally or in writing to anyone, except as authorized by you in writing or as required by law, such as in response to a subpoena or to the United States Trustee in their oversight of this agency or during the investigation of complaints, during on-site visits or during quality service reviews. We may compile and aggregate information that you give us, but this information will not be disclosed in any way that would personally identify you. As one of your options, you have the opportunity to negotiate an alternative payment schedule with regard to each unsecured consumer debt. If you should decide to enter into a Debt Management Plan (“DMP”), in which our agency can provide, (which will be explained in the credit counseling session) you will be provided with separate agreement and disclosure forms. If you choose to use a DMP you may incur additional fees which would be explained to you should you be interested in this program. If you choose to file for bankruptcy, you should know that your bankruptcy will affect your credit report. A bankruptcy does not delete accurate information off of your credit report regarding your past delinquencies. A bankruptcy is a matter of public record and will be reported in the public section of your credit report. A bankruptcy will have a negative effect on your credit report and credit score. A potential creditor, landlord, or employer in the future may view this negatively. Depending on the type of bankruptcy you file, a bankruptcy may remain on your credit report for 7 to 10 years. If, after your counseling session, you choose to enroll in a Debt Management program (DMP), participation in a debt management program may change information which is already on your credit report. If your credit report shows that you have paid your accounts as agreed in the past, a Debt Management Program could have a negative impact on a creditworthiness decision by a potential creditor, landlord, or employer in the future. Our agency has a policy of prohibiting it from paying or receiving referral fees for the referral of clients, except under a fair share agreement. No fees are either paid or received by our agency for the referral of a client to a bankruptcy attorney or any bankruptcy alternative agency. We do provide counseling in English or Spanish, should you require another language please visit the US Trustee site. If you are dissatisfied with the service provided by our agency you can utilize the Complaint Resolution Process. The United State Trustee has reviewed only our credit counseling and personal financial management instructional course pursuant to 11 U.S.C 111(d) and the US Trustees has neither reviewed or approved any other services we provide to clients. If you need to speak with one of our certified bankruptcy counselors please call 316-265-2000 or email your question to us.